Rodeo start times have changed! Friday is 6:00 pm! Saturday is 10:00 am! Description: Both boys and girls may compete in reined cow horse. This is a judged event, not a timed event. Contestants are evaluated in rein work (a pattern consisting of circles, lead changes, sliding stops, spins, and backing up) and cow work (“boxing” or controlling a single cow on the end of the arena, then turning it on the fence and circling it in the open). Judging, scoring and equipment rules are based on the existing National Reined Cow Horse Association rulebook and adapted for NHSRA competition. Rein work and cow work are judged separately on a scale of zero to 80. A score of 70 represents an average performance. The rein work and cow work scores will be added together for the final score. A total score of more than 60 is required to receive placing or points. The best rein work demonstrates a horse that is willingly guided, with little or no apparent resistance. Bad manners exhibited by the horse will be penalized. All deviations from the exact given pattern must be considered a loss of control and marked down accordingly. 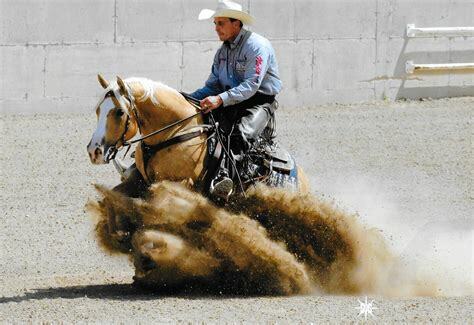 Credit shall be given for the smoothness, finesse, attitude, quickness and authority of performing various maneuvers while using controlled speed which raises the difficulty level and makes the horse more exciting and pleasing to watch. In the cow work, the most difficult work with the greatest degree of control will score the highest. Safety for contestants, horses and livestock is a priority in all aspects of reined cow horse. Study the rules and judges cards for the event. All Contestants and parents should watch the safety video. Copyright 2018 Idaho District 4 High School Rodeo. All rights reserved.